The expansive grounds of Hogwarts School of Witchcraft and Wizardry are home to towering castle turrets, secret passageways, and sprawling green hills, all enveloped by innumerable spells and secrets. The castle itself is filled with shifting staircases lined by animated portraits whose subjects frequently interact with their onlookers. Short-cuts throughout the castle and its surrounding area can be accessed through secret passageways, special tapestries, and twin vanishing cabinets. The Great Hall is the scene of the annual Sorting Ceremony, in which each first-year student is assigned into one of the school's four houses: the courageous Gryffindor, the loyal Hufflepuff, the clever Ravenclaw, and the ambitious Slyterin. As you explore Hogwarts, you will experience the inter-house rivalry of a Quidditch match, sneak through the underground Whomping Willow passageway, shake hands with Hogwarts' many resident ghosts, and come to know the people, stories, and enchantments that fill these ancient and hallowed halls. 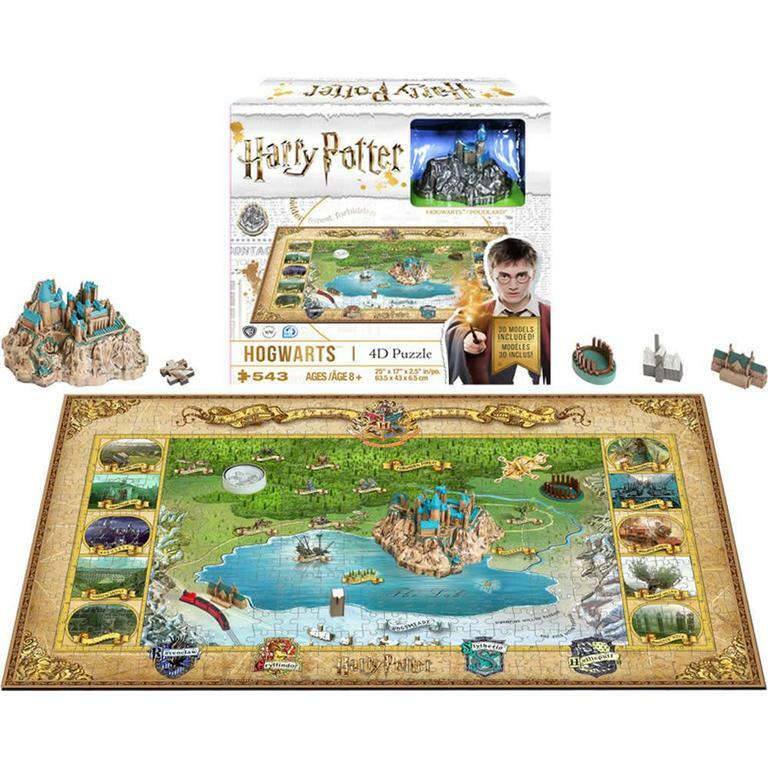 The missing pieces to every Potter fan's list, this beautiful puzzle will guide you through the assembly of Hogwarts™ and surrounding areas in a multi-layer puzzle design. 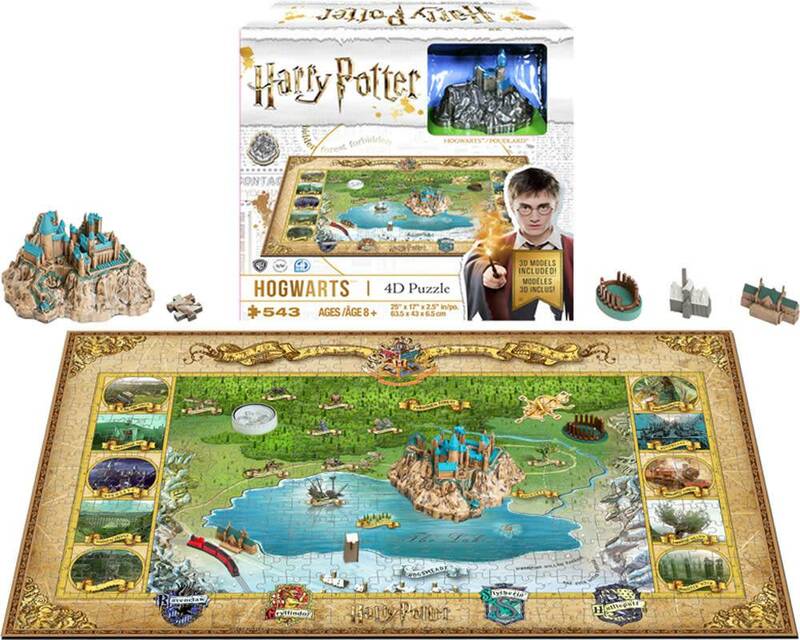 The first layer is a jigsaw puzzle that will teach you all about the various locations and regions of Hogwarts™. The second layer you insert 3D miniature replicas models into the puzzle, which include famous buildings and structures. What's the 4th dimension? Time! The puzzle also includes an Official Guide to Hogwarts™. Hours of fantastical fun! Madam Malkin’s is the place to go for Hogwarts school uniforms, robes, travelling cloaks and also, on very rare occasions, invisibility cloaks. If you're a stranded wizard in need for an urgent, safe and discreet form of transportation, simply stick out your wand arm and the bus will appear!